There are very few contemporary writers like Sam Lipsyte who can mine the dark side so deftly for laughs, so thankfully he didn’t take too long to follow up 2010’s stellar The Ask with another book. 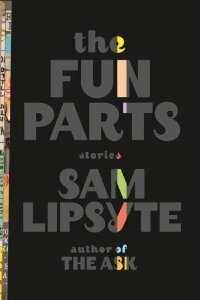 Three years later, Lipsyte is back with Fun Parts, a collection of short stories very much in the same vein as his earlier efforts. This baker’s dozen of stories covers everything from geeks being oppressed by an older, more damaged geek (The Dungeon Master) to a former junkie ballerina and daughter of a Holocaust survivor who starts a relationship with a recovering Neo Nazi (Deniers). While some of the stories are better than others, all share the similar hallmarks of being deeply original and darkly funny. Among the best in this collection is The Wisdom of Doulas, where a clearly unqualified Mitch, with little training and even less social tack and grace, takes a job helping a rich couple in New York handle their new baby and proves his ineptitude with a disastrously hilarious series of events. Despite a few stories that stand out over the others, there is hardly a weak one in this collection. Pitch black humor at its best as only Lipsyte can write. Previous Previous post: Osada Vida – check the first promo track!